This blog post will be updated or replaced when the track construction is completed and the track has been officially opened. 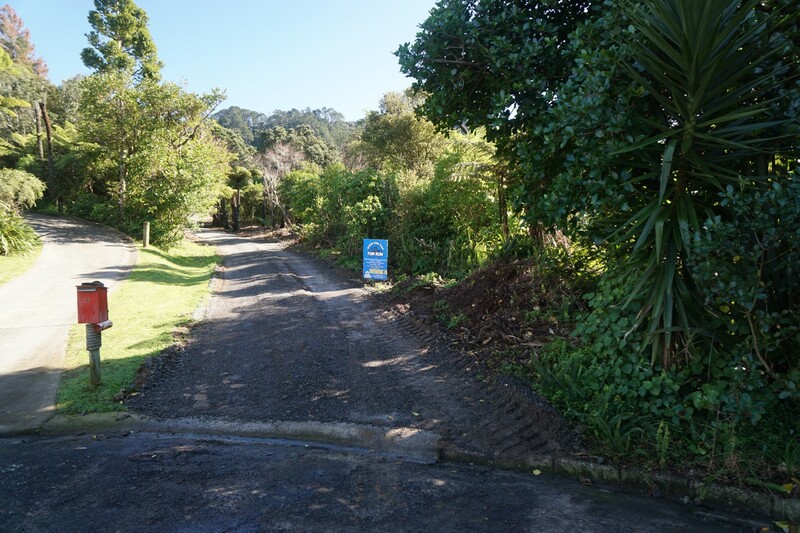 The narrow access road to the reservoir branches off to the left at the end of Pacific Road. 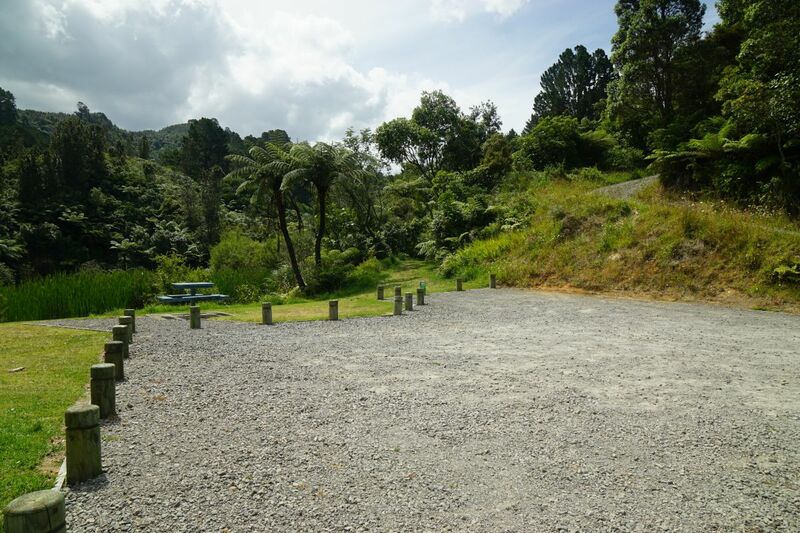 There is a small parking area at the end of the tarsealed access road, with a short gravel continuation of the road up to the reservoir. One end of the Pohutukawa Track (see the Pohutukawa Track blog post) is by the large Pohutukawa tree to the left of the photo. 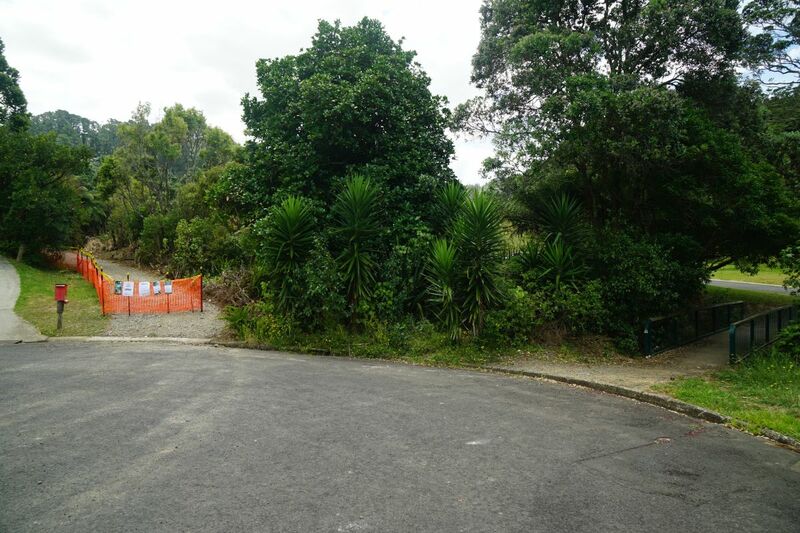 One access to the new track is across a bridge on the far side of the carpark, leading across to Ocean View Road. 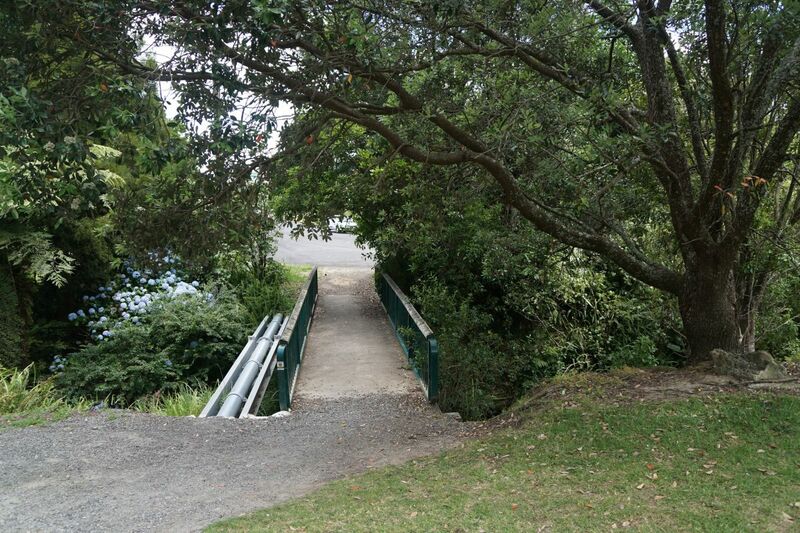 The pedestrian bridge leading from the reservoir access road to Ocean View Road. The track starts immediately to the right after crossing the bridge. Information about the track has been posted on the fence across the track entry. The bridge to the reservoir reserve is on the far right. A map of the track area posted on the fence. 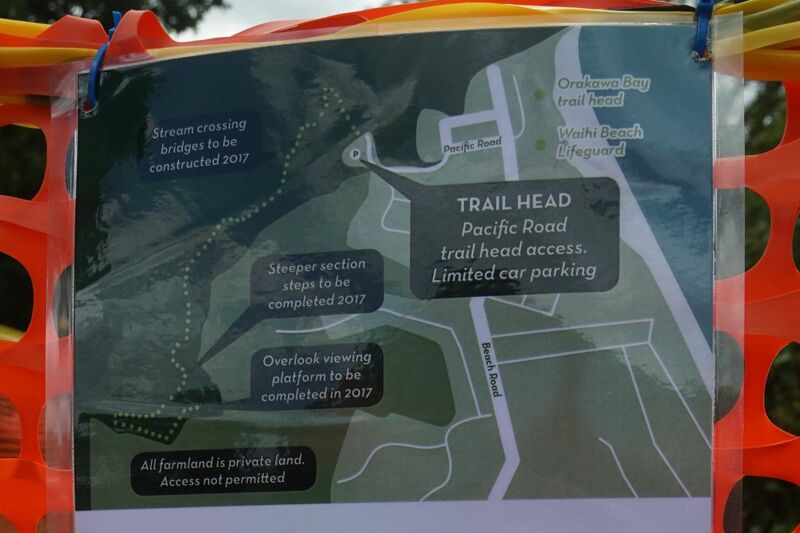 The access off Ocean View Road, where the map is posted, is not shown on this map. 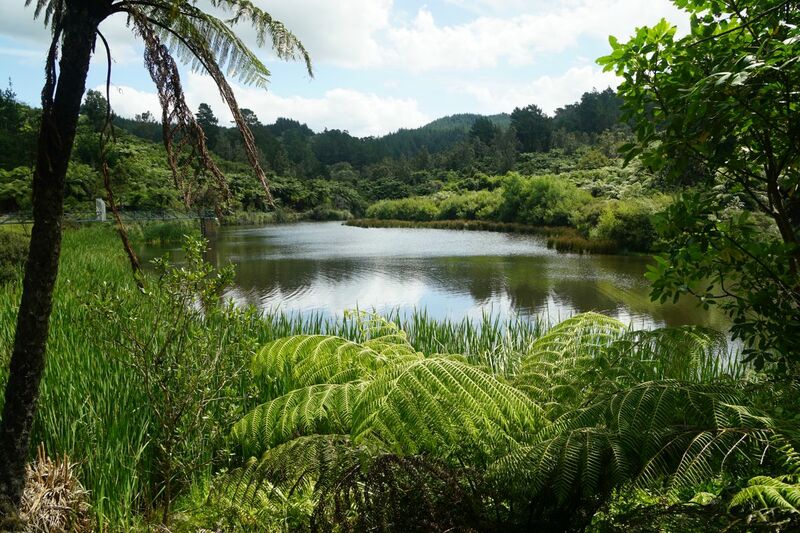 The reservoir seen at the start of the track off Ocean View Road. 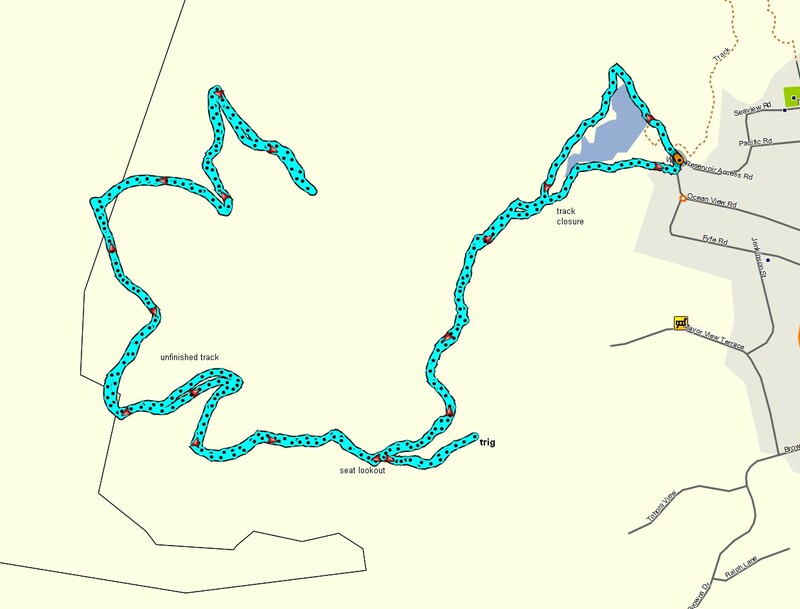 After a short walk along a wide gravel track, the track shown on the map is reached. 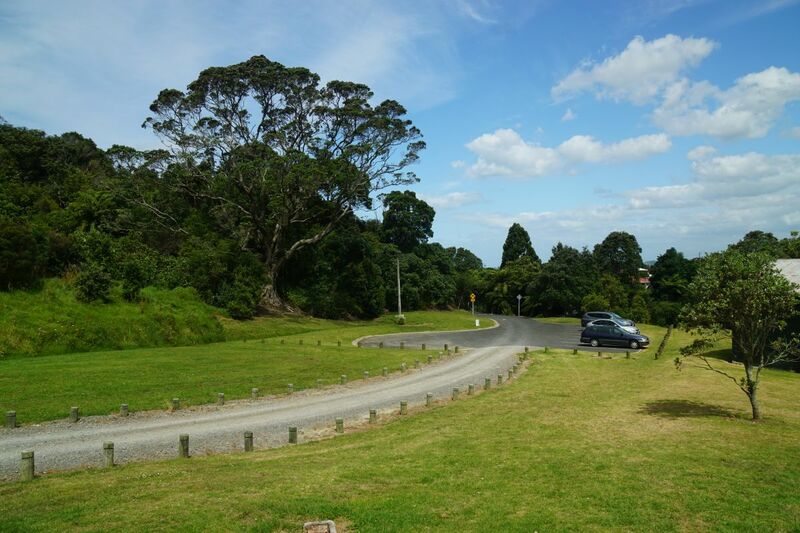 An alternative unformed track to the right leads back around the northern side of the reservoir to the car parking area. 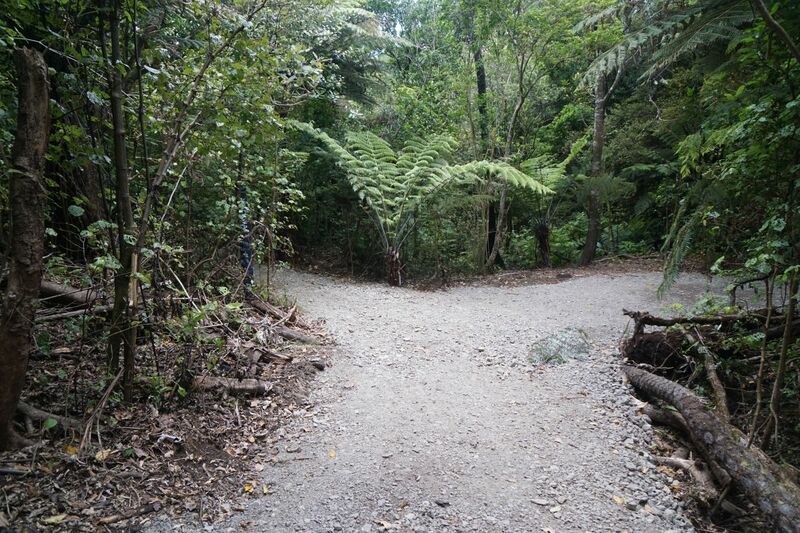 The track to the left leads up to the lookout point. 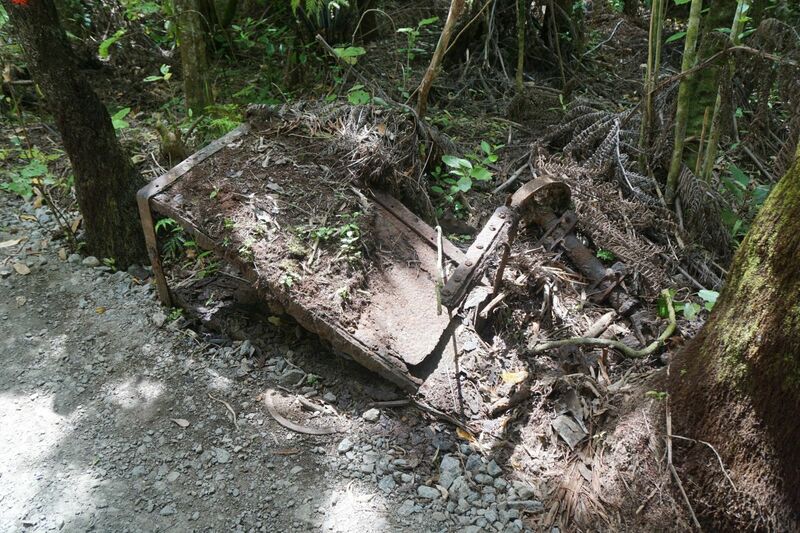 Remnants from gold mining or timber milling can be found in the bush area. 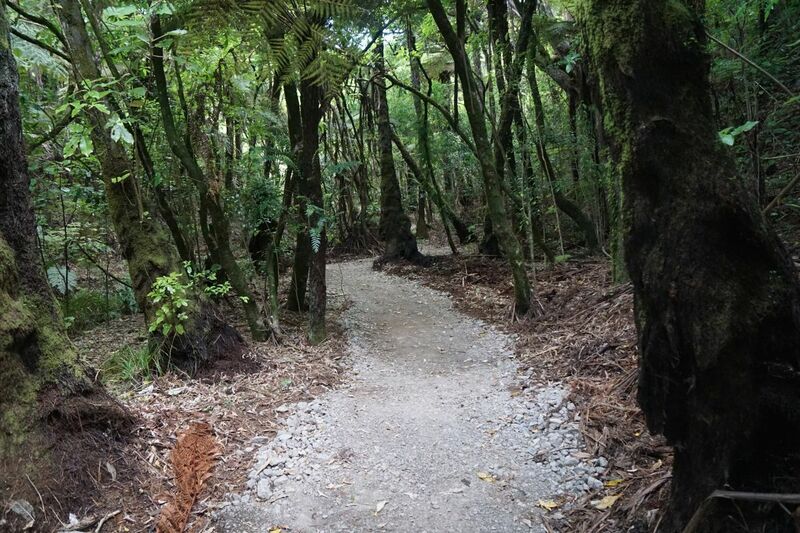 The track to the lookout is gravel all the way. 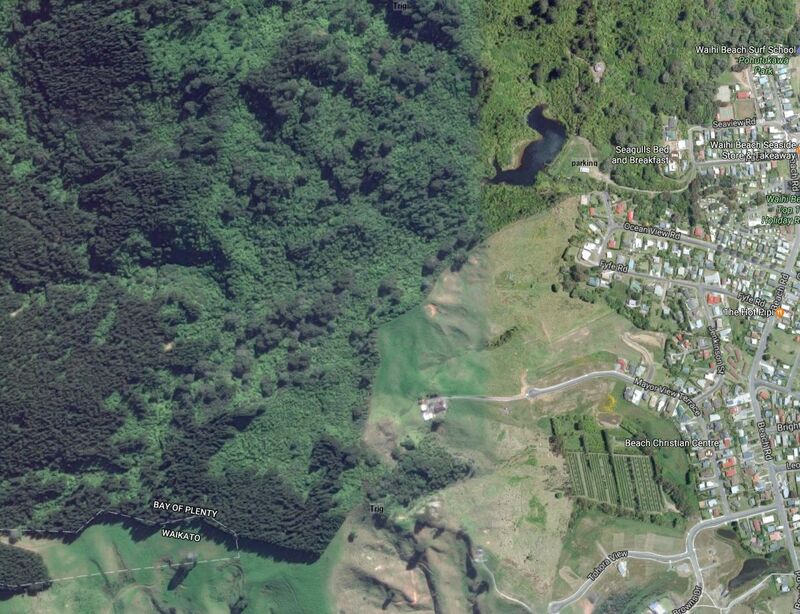 Here wending its way between ponga and other regenerating native vegetation. On the steeper sections a thick rope has been installed along the track. This can be used as a handrail, and is especially useful coming back down the hill. 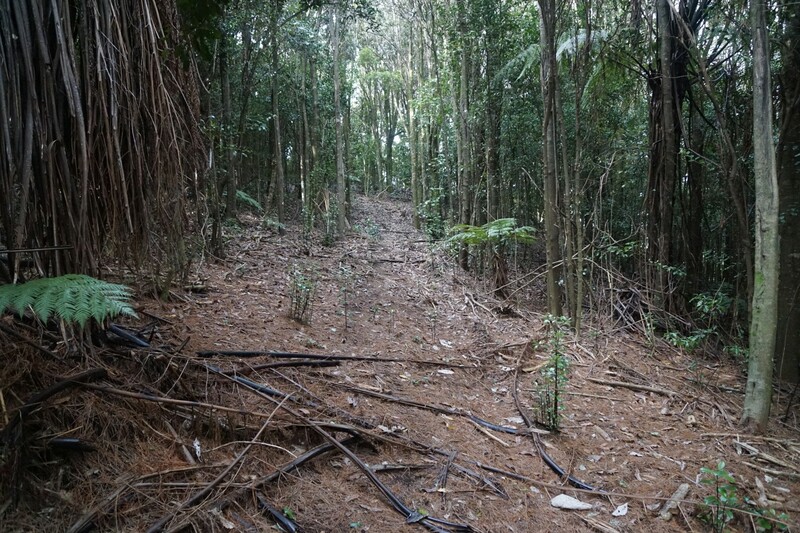 A radiata pine forest is at the top of this steeper section of track. The trig station is not located at the highest point of the track. The track ends at the trig station which can be seen at the far end of the fence. 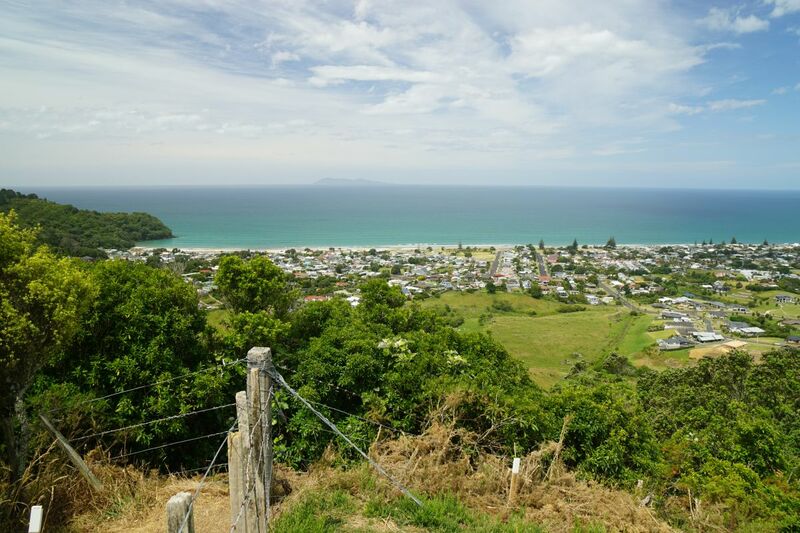 Here a view along Waihi Beach looking east. 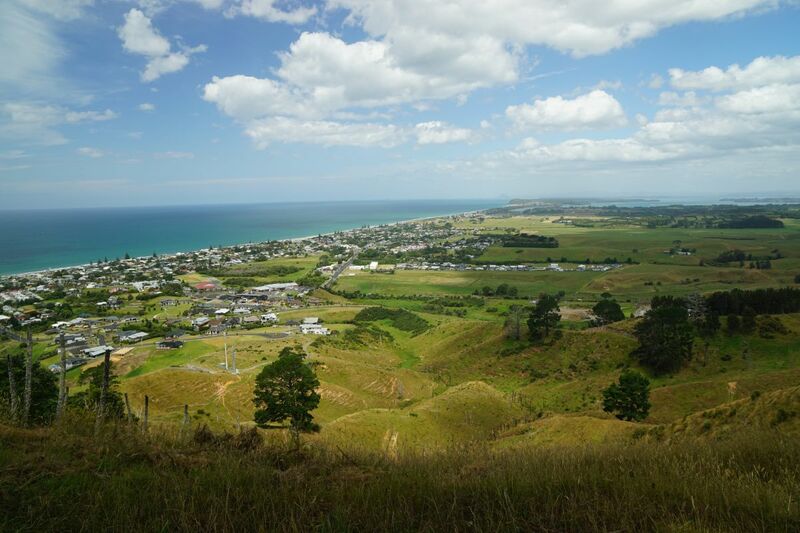 Looking from the trig station across the northern end of Waihi Beach. Tuahu/Mayor Island can be seen in the distance. 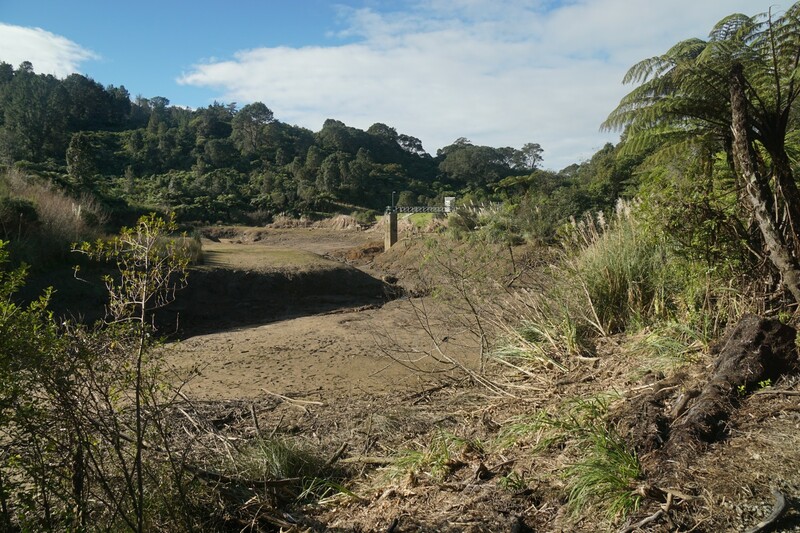 The start of the currently unformed track leading back around the northern side of the reservoir to the carpark. 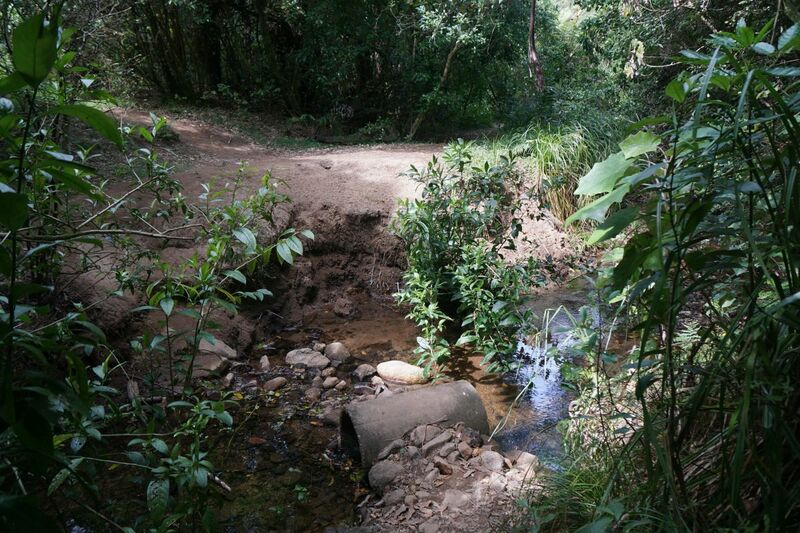 Bridges at the stream crossings will be constructed during 2017. 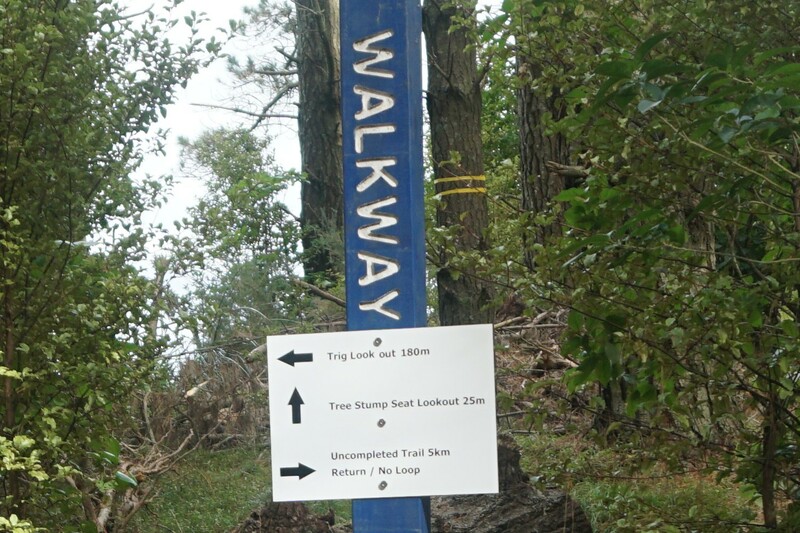 The track improves near the exit to the reservoir and carpark. View across the reservoir from near the end of the track. 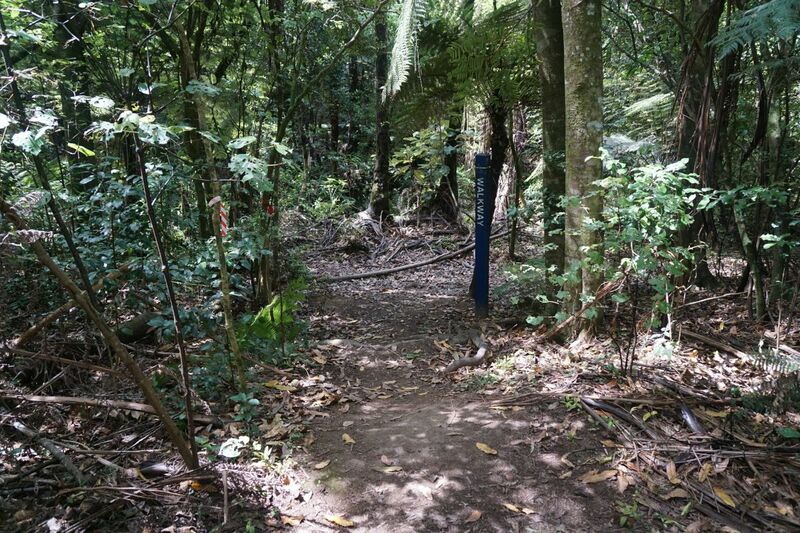 The start or end of the track, according to the posted map, will be at the centre of the picture, to the right of the two ponga. 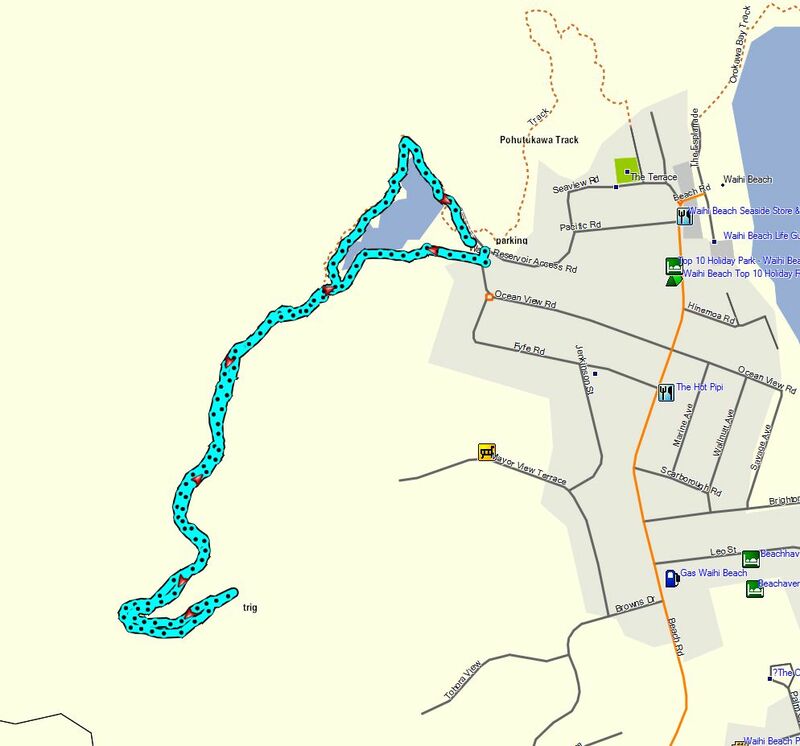 The GPS tracklog shows the route followed, with the track along the southern side of the reservoir taken on the way up to the lookout, and the old track along the northern side on the return walk. Total distance walked was about 3.2 km, for a total time of 1 hour. 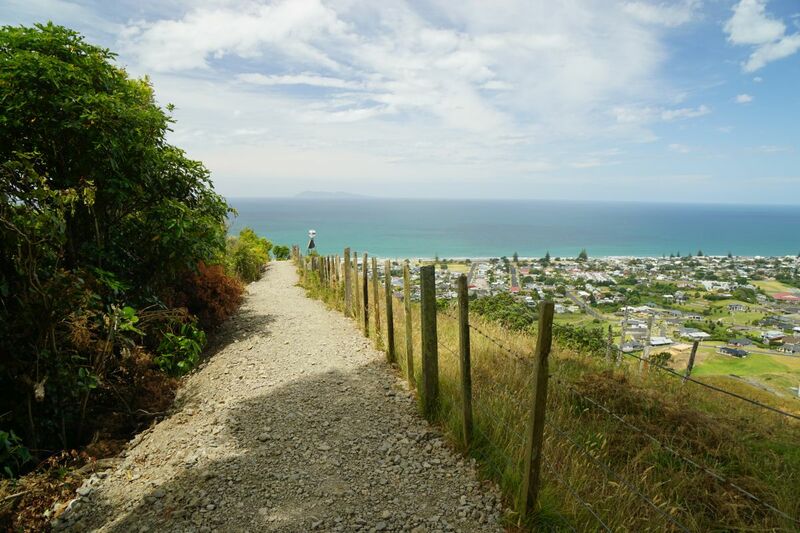 Starting elevation is about 40 metres above sea level, and the highest point about 160 metres above sea level. The trig station is at 151 m asl. The aerial view, taken from Google Maps, shows about the same area as the GPS tracklog map, with the parking area and the trig station marked. The reservoir lake can be seen. 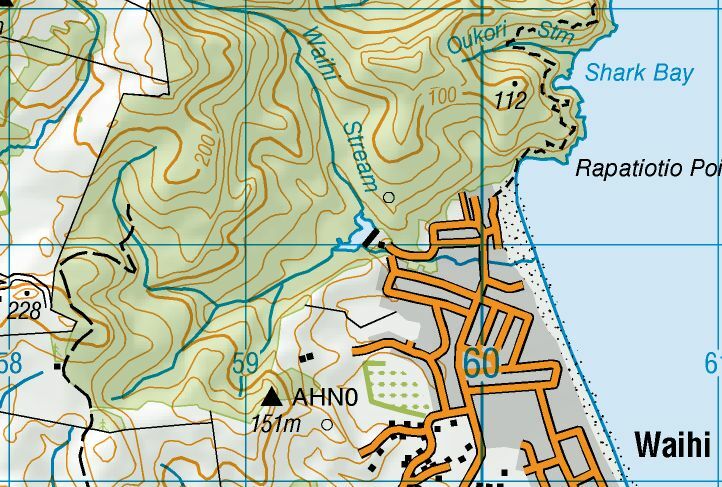 A topographic map excerpt of the same area, with the trig station shown with code AHN0. The track was walked on January 6, 2017. 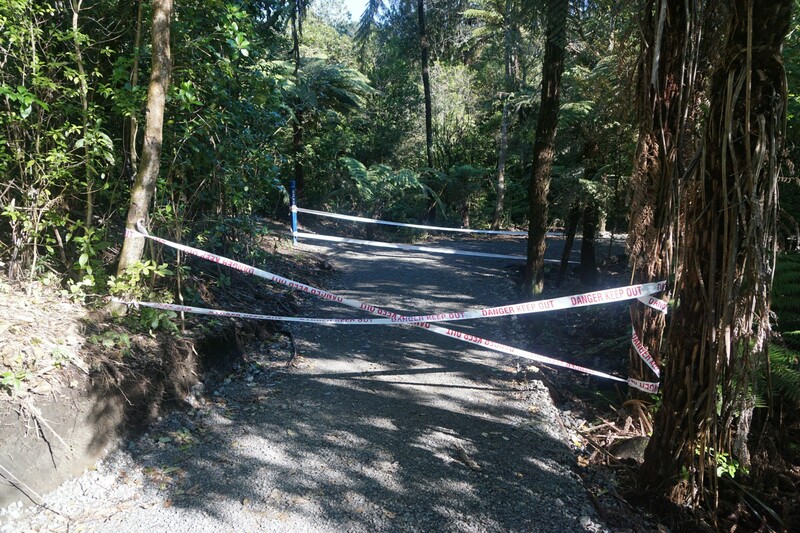 The track entry on Ocean View Road is now unmarked, and probably closed off when work is being done on the track or the reservoir. The sign is a notice for an ‘over the top fun run’ in late September. The reservoir was not looking picturesque on the day. It had been emptied for some reason. Before the junction with the track to the trig station and the track around the reservoir there is currently tape across the track with warnings of danger. Since there is no sign of danger between the two sets of tape almost everyone ignored the warnings. 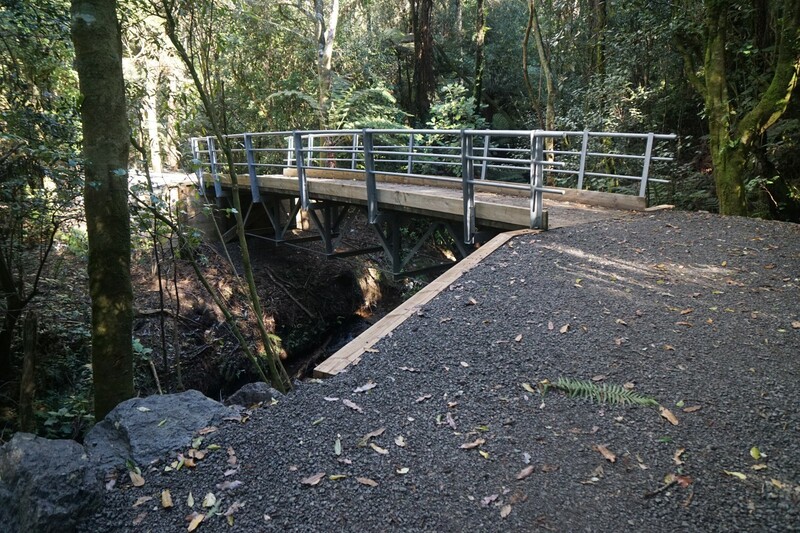 The track around the northern side of the reservoir has been transformed and a new bridge built over the stream. It’s now an easy almost level walk. 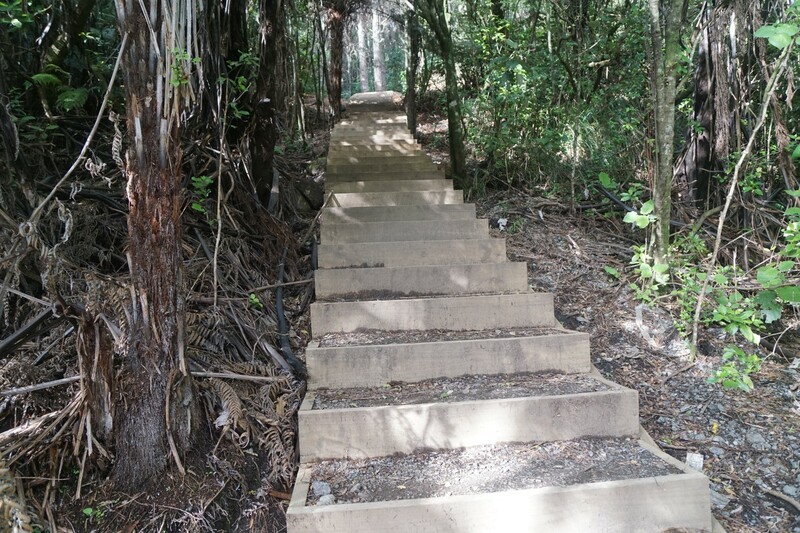 Steps have been built on all the steeper sections of the track leading to the trig station. At the top of the hill a new track has been opened up, leading to the right. 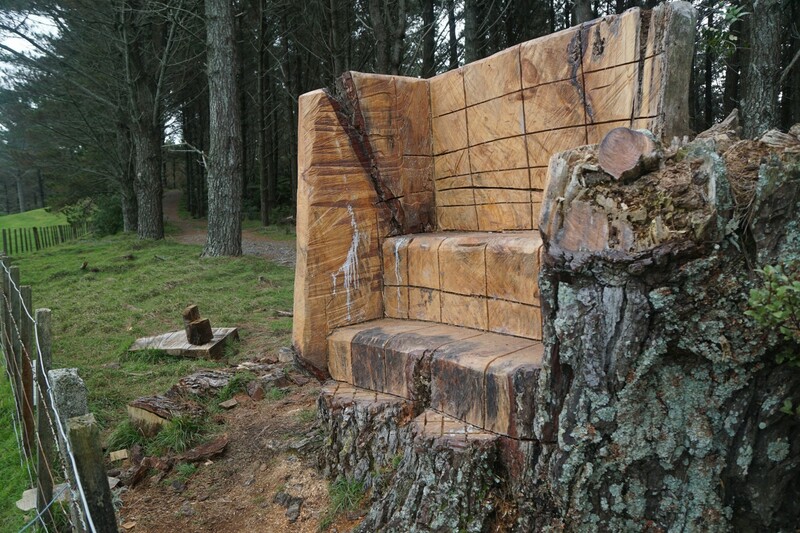 Close to the intersection there is a seat lookout carved into a large tree stump. 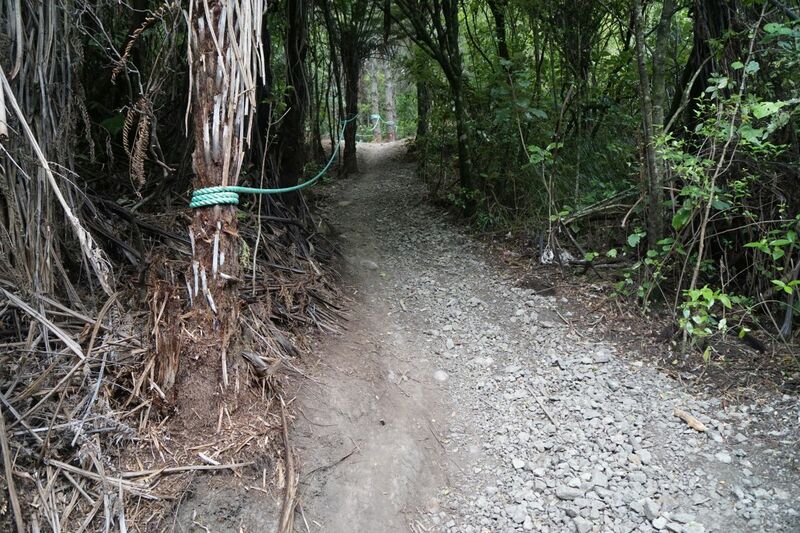 The new uncompleted trail continues through the trees to the left of the seat. 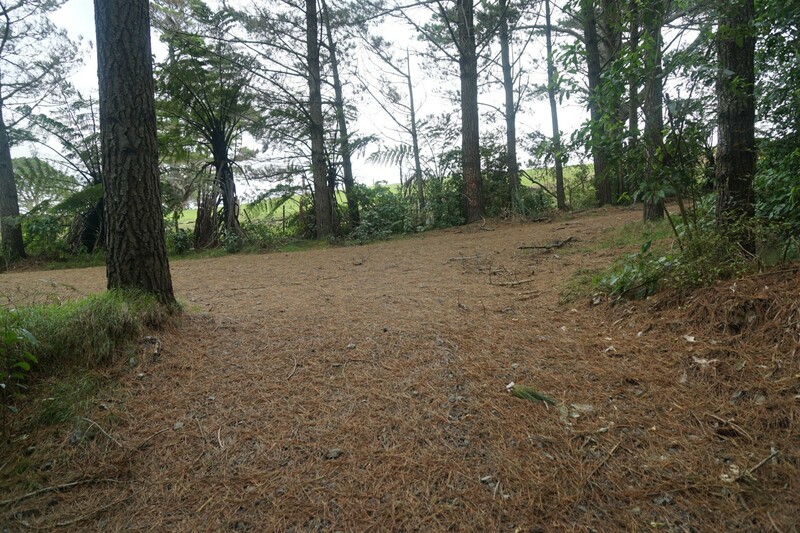 The new trail is about 2.5 km long, and well formed with surface gravel most of the way, and no steps. However it is quite steep in a few places. About 1 km from the start there is a junction. 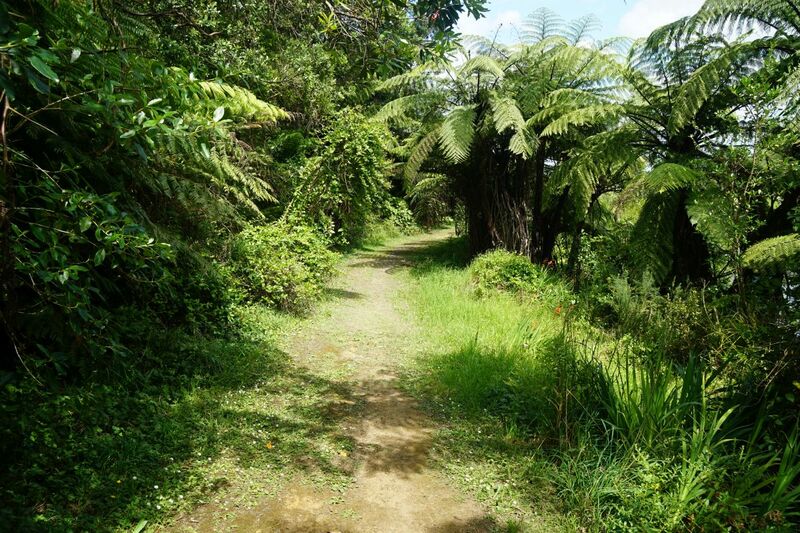 The track to the left leads to private land and a closed gate. The trail continues instead to the right. 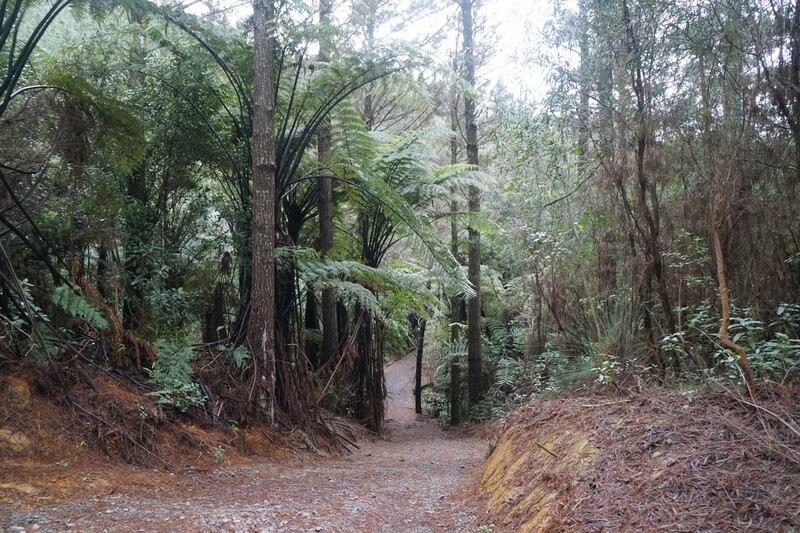 After about 2.5 km the track ends in regenerating native bush. 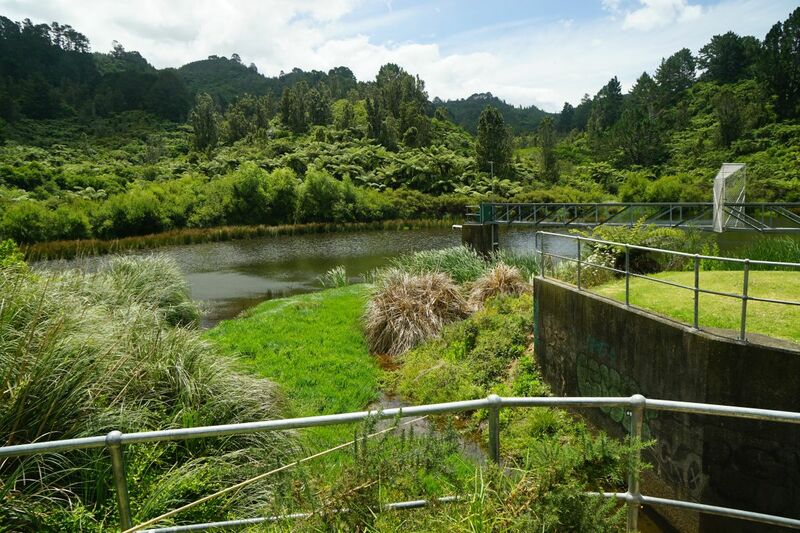 There is no view from the track, although it’s possible in a few places to access the boundary fence close to the track with views over farmland. The trig station track and the uncompleted trail are shown on the GPS tracklog. The tracks were walked on July 16, 2017.